When I did a short work stint at Secure Decisions in 2018, one of the projects I got to work on was helping to create the Attack Surface Detector plugin for ZAP and Burp Suite. I left that position before the project got published, but I am happy to see that it was a success. The Attack Surface Detector tool uncovers the endpoints of a web application, the parameters these endpoints accept, and the data type of those parameters. This includes the unlinked endpoints a spider won’t find in client-side code, or optional parameters totally unused in client-side code. It also has the capability to calculate the changes in attack surface between two versions of an application. There is a video that demonstrates the plugin, and yes, that is me doing the voice-over. Since recently discovering there is now an official Kali Linux docker image, I’ve been fiddling with it and tweaking my own setup to get it to how I like it for the things I use it for. I have a work version and a personal version. What follows is my personal version, used mostly for R&D, CTF challenges, and bug hunting in my free time. Mount the defined folders to be shared from host to docker. Hope that’s useful to someone! 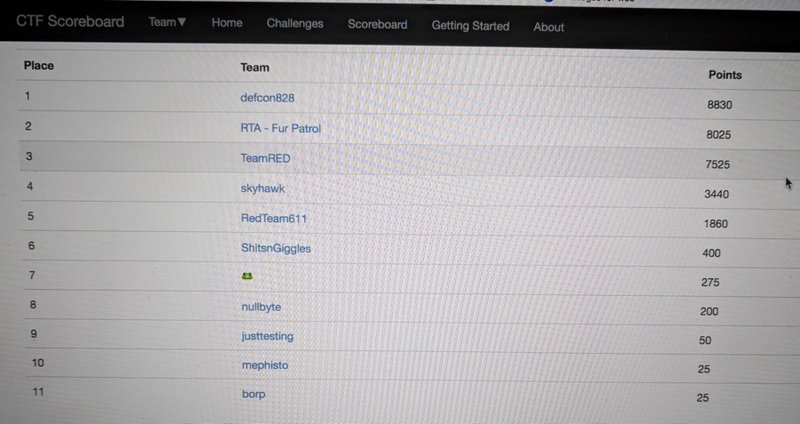 Along with my friend eth3real (and some pitching in from our new friend Brian), we teamed up as DefCon828 and won the Capture the Flag contest at BSides Asheville today. The loot was some cool WiFi Pineapple gear. Last month, Jess and I won 1st and 2nd place respectively at BlueRidgeCon. I do feel bad about missing out on the lectures, talks, and socialization at these awesome conferences, but I can’t stay away from the CTFs. It’s bad. What Note Taking App is Best for PWK and OSCP? It is a fair question considering Keepnote is recommended in the PWK course materials. However, you may notice that it hasn’t been updated in over 6 years, and has actually been dropped from recent Kali versions. I have heard tales of OSCP students’ notes getting corrupted and lost, which is not a good situation to face when you are paying for limited time to complete the coursework (and exam). If you are starting down the PWK/OSCP path, you will soon realize that you will need to take a lot of notes. Not just on the course materials, but on every exercise you do and every machine in the lab that you work on. This includes screenshots, copy-pasted output from nmap and other tools, and the specific steps you took to conquer a box (and hopefully the steps that didn’t work, from which you can reference in the future). It adds up quickly, and it’s a challenge to keep straight as you hack away at box after box in the lab. Being a person that has kept a keen eye on note taking apps in general, long before I got my OSCP, I have some recommendations, with pros and cons of each. Learn more and download CherryTree here. CherryTree is like KeepNote in many ways, but it is has many more features and is actively maintained. If you are going to be solely storing and referencing your notes on one machine (your host or Kali VM), use this tool. The template feature is really awesome, and it lets you create a new note based on a template of your design. This means you could create a template for Lab VMs that you can quickly populate with data as you work on a given machine. You could do something similar for PWK exercises. It should make reporting much easier. My struggles with Evernote have been well documented on this blog in the past, but some people still swear by it, so I thought I’d mention it here. They do make ease-of-access a priority, and you can get to your Evernote stuff from just about anywhere. Using it is easy until you need to organize things with any complexity, and for the PWK labs, you’d have to be OK with using the #tags instead of folders. Download Onenote from Microsoft here. After many trials and tribulations, I ended up going all-in with Onenote for PWK/OSCP, and life in general. The ability to create multiple, separate notebooks (and choose which ones you want to see on which devices) has been my favorite feature. I can separate work from life from projects from shared stuff this way, and I still have a good amount of hierarchical ability to organize things. I see people profess their undying devotion to markdown when the note-taking discussion comes up in various OSCP forums/chats, and I respect their decision and desire for simplicity. However, the one feature I used most, and I can’t imagine living without in the OSCP course, is the ability to paste a screenshot into a note. I did this so much that it would have driven me crazy to have to do anything else, and with markdown, you have to do some form of “save image/reference image via text in the note/embed via some other mechanism”. There are extra steps involved, and you can’t easily do the copy/paste thing. Snap ‘n Drag Pro (Mac only). Awesome customization options, ability to edit captures (add arrows/highlight/blurs), automatically adds to clipboard. For PWK, I found the Evernote and Onenote clipper browser extensions to be limiting in that they only let you clip things from your web browser, when I needed to clip terminal output most frequently. Because I am primarily a Mac user, I need good support for screenshot pasting, and I prefer hierarchical note structure for organization, I went with Onenote and Snap ‘n Drag Pro for my PWK and OSCP work. I continue to use these two tools in my personal and professional life, too. If I were not a Mac user, I’d go with CherryTree and Skitch. Have any opinions or additional input about all of this? Let me know in the comments.